Feel Good In Your Space | Change your space, improve your life! 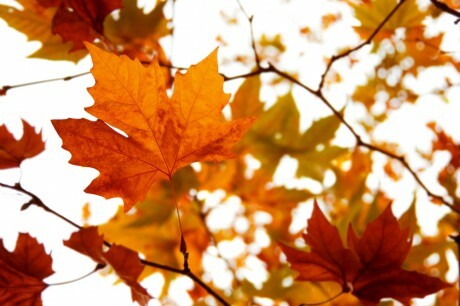 November is the beginning of the holiday season when we make more of an effort to be with family and friends. We reminisce about past family gatherings, and even joke about events that didn’t seem so funny back when they happened. New memories are made while old ones are shared with the next generation. Traditions continue and new ones begin. For some, however, these upcoming holidays may be sad or bittersweet. Those of you who have lost a family member, or close friend recently, may not feel like celebrating or may even feel guilty about being happy during this time. My husband and I have lost both of our parents, my mom being the most recent three years ago. During the holiday season, I do feel sad that our two kids no longer have grandparents to send ‘Merry Christmas’ cards to, or to call them up on Christmas morning to hear their voices and tell them how much they love them. As I put up our tree and pull out stockings and special handmade decorations each year, I am reminded of past holidays with both of my parents. For several years, my husband, our two kids and I would pack up our minivan and drive ten hours to spend a few days with my parents for Christmas. On Christmas Eve, we would all pile into the van and drive around neighborhoods looking at the lights and decorations, then come home and drink hot chocolate topped with lots of whipped cream! Another tradition, I vividly remember, was my dad banging on all of our bedroom doors early in the morning yelling “Merry Christmas! I’m Up…Everybody Up! !” Recalling these memories now still cause me to tear up, because I know they will never happen again. But, then I remind myself that I’d rather have those happy memories than to never have had them at all. These are the memories that shaped the traditions we now share in our own home. We still drive around on Christmas Eve, looking at holiday lights, and come home to hot chocolate topped with lots of whipped cream. And, when we can wake up before our kids do, we bang on their bedroom doors too! Grieving is a necessary and natural process, and I am not at all suggesting that this be done quickly. I just wanted to offer a few suggestions, that helped me through the first Christmas after my mom passed, that may help lighten your heart a bit during these upcoming holidays. I believe that celebrating life is the best way to honor our departed loved ones. And, knowing my parents the way I did, I feel they would want to see me happy and smiling when I think of them, especially during this time of the year. I still shed a few tears, especially on my November birthday, but the happy feelings I have when I remember them now outweigh the heavy heart I used to have. Display feel good photos of your loved ones. These represent the best of who they were in the physical, and what a wonderful way to include them in your current life happenings. As time passes, children often worry that they will forget what their loved ones looked like. Keeping their positive energy in a photo, displayed in the family or main living area, is a perfect way to have all of you still feel connected. Keep stoic or stern looking photos packed away (or even toss them). I believe that only happy expressions are worth honoring. 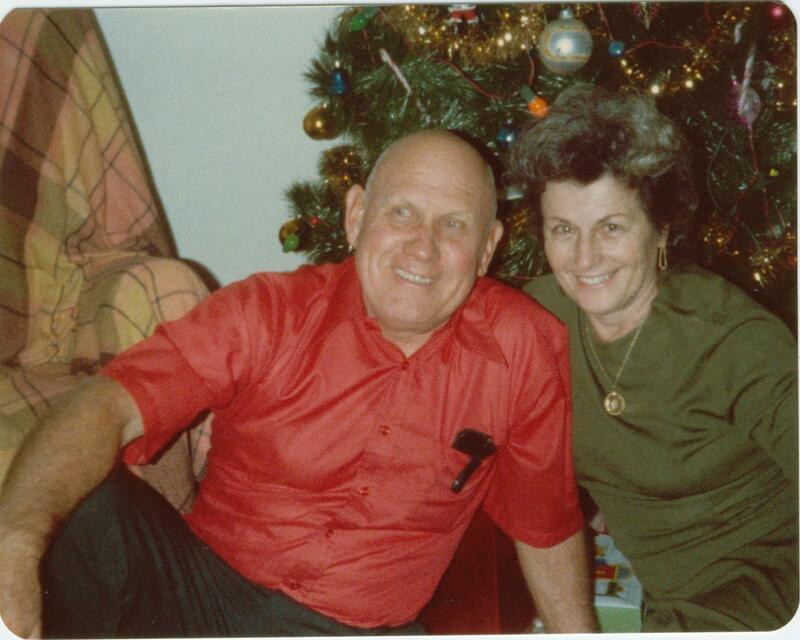 I love this picture of my parents, sitting in front of our Christmas tree, from back in the 1970’s. This is how I think of them every Christmas. I smile whenever I look at this photo, and feel them close to me as our family celebrates together. Honor the family traditions that you loved doing together. If your family had a tradition of going to the movies on Christmas Day, then go to the movies on Christmas Day. If you used to drive around looking at Christmas lights on Christmas Eve, drive around and look at Christmas lights on Christmas Eve. Traditions give a sense of continuity and offer comfort. They honor what was important to you in the past. You will feel a stronger connection during the holidays by celebrating those traditions you enjoyed together. You may even find a new tradition to honor their memory. Bring more light into your space. The inward Yin energy of Winter can increase feelings of lethargy and depression. We spend more time indoors and lose the benefit of sunlight to boost our Vitamin D levels, which contribute to our sense of well-being. Expose yourself to brighter Yang energy by allowing as much light into your house as possible each day, or bundle up and go outside, even if for only 20-30 minutes. If neither of these options work, invest in a light box or lamp for your home, which simulates sunlight. These have been used successfully to treat Seasonal Affective Disorder (SAD) as well. Keep clutter to a minimum to allow for more breathing space for you and your home, and deep breathing is one of the best ways I know to relax your mind and body. If you need an energy boost, try removing at least 9 things from your home. I modified an old feng shui cure for shifting energy (which recommends moving 27 things) because I didn’t want to just move things, I wanted to release some stuff. By starting with just 9 items, I felt better and was inspired to release more unwanted energy out of my personal space, which helped me feel not only physically, but emotionally lighter. Add pops of a favorite bright color to your Winter decor. Earth colors such as brown, tan and rust, tend to be the general choice for creating a cocooning effect, but if overused can significantly drop the energy of the home’s residents. Brighter colors, such as orange and yellow, can do wonders to lift spirits. Consider using these friendly colors in small doses with candles, a throw or toss pillows. Adding metallics such as silver or gold, will also do the same to boost your energy quotient. Bring nature inside. This is a simple and inexpensive way to feel connected to the outside world. Special rocks, interesting looking bare branches, sprigs of greenery and pinecones all work, just make sure they are clean and bug free before bringing them indoors. Artificial also counts if you cannot readily find the real deal. Spend some private time with your feelings. This can be during prayer, meditation, a visit to a memorial site or favorite place, or just a walk out in nature. However you feel connected with your loved one and God, Universal Spirit, or another name you may use to address the eternal life energy, spend time with your feelings. Talk with your loved one, in your thoughts or out loud, and say what is in your heart. Be honest and don’t judge how you respond. Sometimes, we need to sob, vent, curse or apologize to express how we feel, and get it out into the light of day so healing can begin. Afterwards, take a very deep breath (or two or five), and continue on with your day. This will allow you to release some of the pain and remember more of the joy and love. It’s the first week of October and time for my Fall Cleaning ritual. As we head into the mostly yin (colder, darker, cocooning, inward energy) part of the year (Fall and Winter), I find that giving our home a good dose of yang (brighter, active, expanding) energy gets me better prepared to face less daylight hours and more time spent indoors. Whenever we give our home a thorough cleaning, there is an automatic lifting of our spirits. I feel more at ease and relaxed. It is as if my home is smiling and saying Thank You! This is not to say that I look forward to the tasks, and I even procrastinate starting cleaning projects. But today, I discovered that there is one chore I now enjoy as a meditative activity. 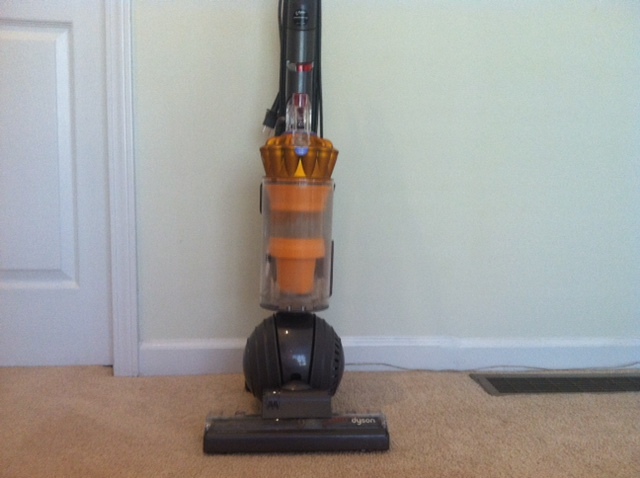 This morning, while vacuuming our family room, moving forward and back, forward and back, forward and back, I looked down at the clear canister of my Dyson and saw an amazing amount of dirt, fur and debris swirling around. How could this be? I made only three passes at a section of the room, and the carpet didn’t look that dirty! After completing the room, I had the urge to re-vacuum and see if there was anything left to pick up. I did and…There was! From this seemingly boring act of vacuuming, I fully realized how much debris we become clueless to in our homes. Even seasoned Feng Shui consultants cannot always see what is lurking in their own spaces! In Feng Shui, what you don’t see still affects you. Most of the time, the reason we feel stuck in our lives is because we have this residual gunk hanging around. It needs to be cleaned up to continue moving forward. If it hangs around too long, it will likely cause dis-ease in the forms of anxiety, frustration, depression, weight gain, and general malaise. After having our carpets professionally deep cleaned today, I felt lighter and happier. This has given me the inspiration to get to the rest of my projects! Doing a deep Fall cleaning of your home gives you a fresh perspective on life and renews your energy for the upcoming months. From a Feng Shui perspective, I have listed the priority areas that I focus on first. The Front Entrance. This is where ch’i (or life energy) enters your home. Welcome it in with a clean and clear pathway (leaves and weeds be-gone). Make sure all windows are sparkling, inside and out. Clear all cobwebs, dead bugs and clutter from the front door. Have a beautiful Welcome mat out. Make sure the door handle and doorbell are in good working order and that the address numbers are visible for ch’i (and visitors) to find you. The door needs to open fully with no obstructions. The Kitchen. The stove is the most important appliance in your home. It represents wealth and abundance in Feng Shui. Keep it clean at all times. Have all burners in good working order and use all of them regularly. This sets the intention that prosperity and abundance continuously flows and won’t become stagnant. Treat the refrigerator with the same respect. After all, this is where a large portion of your abundance is stored! Toss outdated food, wash down the shelves and drawers and organize what is left. Only purchase what you know will be consumed in a short period of time. Bulk purchasing of perishables often wastes more of your money than it saves. Clean the kitchen floors and wiped down cabinets. Give your countertops a thorough cleaning and simplify what you have on display. Cull the excess appliances and gadgets in your cabinets as well. Only keep what you regularly use and love. If you don’t use the waffle maker, now that you’re on a gluten-free diet, donate it. If you still have the cookie press you received as a gift, but have never used it, donate or give it away. A clean kitchen gives you room to breathe in a place that is meant to nourish and revitalize the body and spirit. The floors, window coverings and furniture. These take the most abuse throughout the year and fabric holds in more dust, grime and negative energy than hard surfaces. Clean carpets and window coverings make a significant shift in a room’s feel. This is especially true if it has been closed up or the occupants have recently gone through a hardship. You can actually feel how much happier the space feels! If professional upholstery cleaning is not feasible, a good vacuuming will also do wonders. The Bedrooms. You function better in your life when you sleep well, especially during the potentially stressful holiday season. Open the windows and bring fresh air in. Give the bed a good airing as well. I won’t get into the details that most of us have heard, about the importance of having a good quality mattress, but make sure it is clean and in good condition. Refresh your decor by changing out anything that you no longer absolutely love. Resist the urge to decorate your bedroom for the holidays. Too many add-ins, especially greenery (real or artificial), Santas or other figurines, increases the activity energy in the room and most likely will affect your sleep. It is better to keep the holiday decor in more active areas of your home. 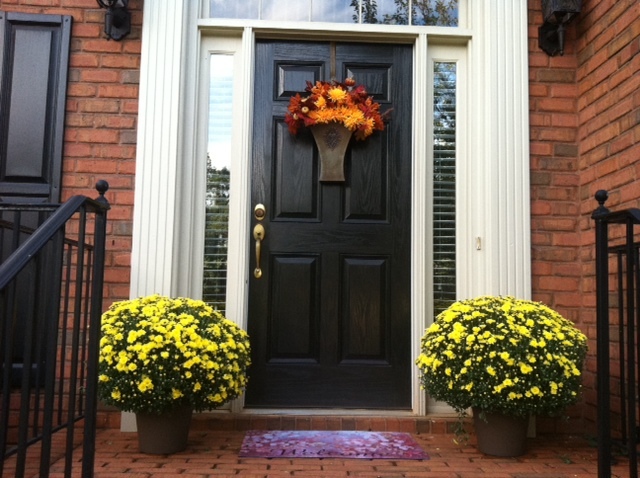 Keep the holiday decorations in active areas of your home, such as the front entry. Well, it’s time to give my kitchen some love and well deserved re-energizing. 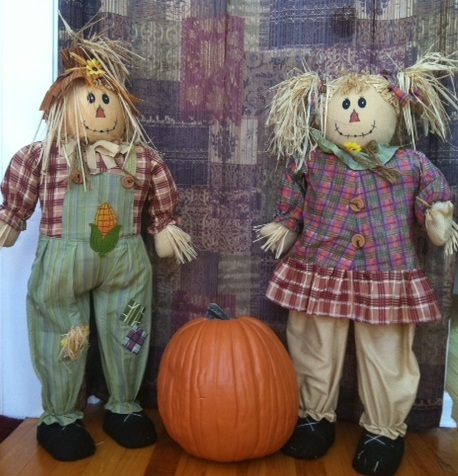 What area in your home will be first on your Fall Cleaning list? Energy Clearing – Kim space cleared her bedroom, with the door open, by playing her favorite music while burning incense and a favorite scented candle. She used a feather to circulate the energy throughout the room, with the intent of dissipating the old energy and welcoming positive energy into the space. Space clearing works because of the intention behind the actions, no matter how you choose to do it. Kim felt lighter and happier afterwards, so the clearing was a success! Decorating with Intention – Everyone should have something wonderful to see upon awakening, and before going to sleep. 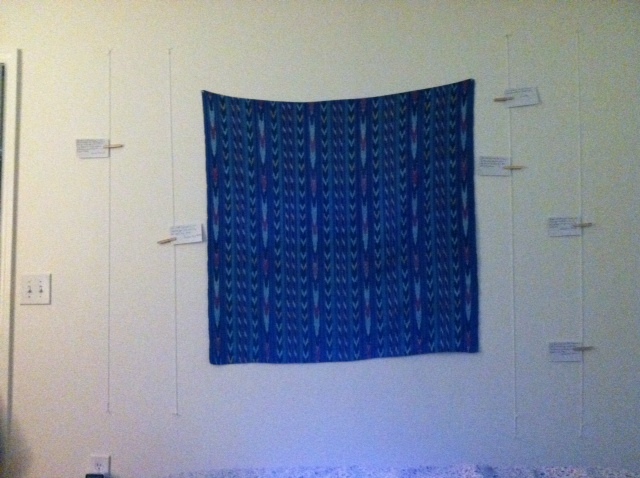 Respecting the contraints of a student’s budget, (and no nails allowed), Kim chose a favorite scarf (the dark blue color was deliberate – to bring in the Water element of her Career area), and pinned it on the wall in front of her bed, then placed index cards with clothes pins on vertical strings on either side. On each of these cards she wrote a positive or inspirational statement. 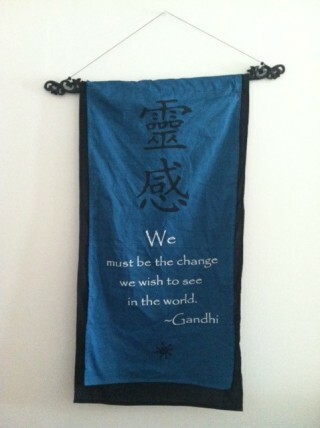 Her favorite has always been from Ghandi: Be The Change You Wish To See In The World. You can see in the photo above, she also has a wall hanging of this quote, which she placed next to her desk. A view from the bed with a favorite scarf and inspiring words! It is important for students to use the desk as the place to study, which is included in all college abodes, . As comfortable as the bed seems for reading and doing homework, all of the stress from studying for exams and pulling late night cram sessions accumulates and energizes the bed too much for a good night’s sleep. It also is terrible for your back! Once Kim understood this, she was committed to having her desk be a comfortable and inspiring study spot. 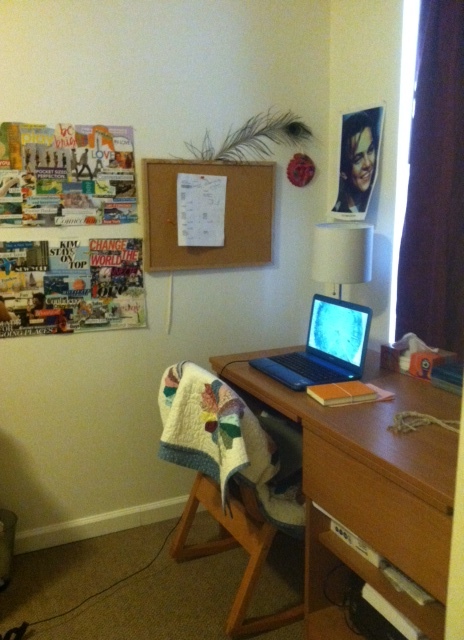 She surrounded herself with her vision boards, a handmade quilt from a favorite aunt, a clean desk top and, of course, a picture of her longtime fantasy crush, Leonardo DiCaprio, (hey, a girl’s gotta have something nice to rest her eyes upon occasionally)! Although her desk did not have an ideal feng shui location, she is next to the only window in the room and can look out onto the grass courtyard below, to give her energy a lift. She is also able to see her door to the side (but it is not in direct line with the chair). When she is ready for bed, Kim can drape a blanket over it, to cover any unfinished homework assignments, her laptop and her printer. Out of sight, out of mind! Kim’s bed was already in the power position of the room – she can see her door, but is not in line with it. 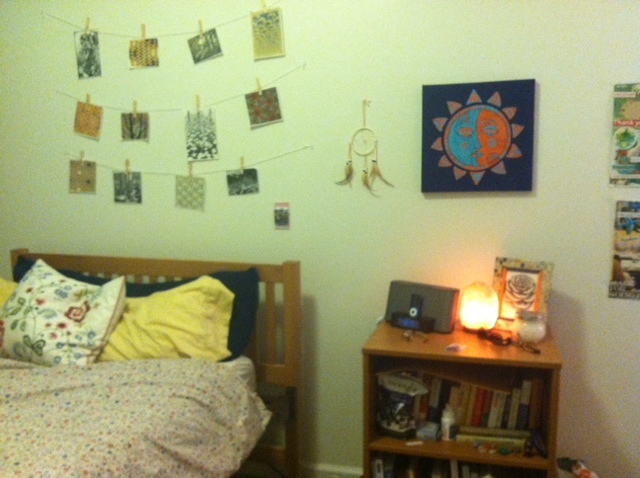 Above her bed, she hung favorite pictures she has been collecting over the past few years. Her bed is dressed in yellow sheets and a comfy duvee cover, to keep her feeling cozy and grounded while she sleeps. A Himilayan salt lamp stays on during the day, to help cleanse the air near her bed, and her dreamcatcher hangs nearby, to collect any bad dreams. The next step in her process is to find another beautiful scarf, or piece of fabric, to cover the bookshelf contents while sleeping. My daughter’s decor is a wonderful reflection of her ingenuity, intuition and style, and she is proud of what she has accomplished on her own. Here’s to an AWESOME school year, Sweetie! I can’t speak for the rest of the world, but here, in the United States, we tend to identify strongly with the vehicles we drive. They have become an extension of our own personalities,or personalities we wish to show others. The color of your vehicle does have an impact on the way you drive and the energy you project on the road. Are you driving the best reflection of who you are? Red, Orange and Bright Yellow are FIRE colors and reflect high energy, passion, assertiveness and aggression – very yang traits. Fire wants to be noticed! Being a Sagittarius, I am already a Fire sign, and for some reason, whenever I drive a red vehicle, it always drives way over the speed limit. Go figure! If you tend to be a highly ‘driven’ individual, a red car may make you more so. If you are wanting to be more noticed in the world, a FIRE color will definitely help you do that. Just watch for a shift in your driving energy and attitude! These colors would be fun for Earth energies, who usually play it safe, but would like to be more noticed in their field of work, or life, in general! As an aside, I have a confession to make. Although I absolutely LOVE Bumblebee Yellow Camaros, I probably will never own one. In my early adulthood, I owned a bright yellow 1976 VW Rabbit, which I enjoyed so much! I was stopped several times for going over the speed limit and, without getting into the details, I went a bit airborne once while driving too fast getting onto the Coronado Bridge in San Diego (I hope my kids don’t read this)! Fortunately, my outcomes were uneventful, but I learned that fire-colored cars and I are not a good match. I prefer the focus and concentration I get when driving a white vehicle. Blue and Green are WOOD energy colors and represent a flexible and strong energy. Green has dropped considerably in popularity, but blue is a color on the rise again. Blue would be a great color choice if you are wanting to express yourself more, but not flamboyantly. But, be aware that the brighter the color, the higher the energy level. Neon green and bright blue have much stronger vibes and therefore stronger driving energy! Browns, Tans and Pale Yellow represent the grounded EARTH element, which make them some of the safest energy colors to have on the road. They also happen to be considered the most sedate and are the least purchased – how often do you see tan cars in traffic? An EARTH energy color would definitely be most attractive to people’s whose first considerations are dependability and reliability – very yin traits. Earth also represents a feeling of calmness. Brown, tan & yellow vehicles were very popular in the 60′s & 70′s – a time when our society was in upheaval and the older generation wanted to keep the status quo. My mom drove a light yellow 1970 Mercury Montego and my dad a 1965 light yellow Chevy Truck (I forgot to mention that my dad was a California State Driver License Examiner too). There is definitely a benefit to having these colors on the road – you just might not be able to find as many available for purchase. The desire today is to drive something with more energy & personality! White, Gray, Silver, Gold and other metallic colored cars represent METAL energy, which help with concentration and staying on task while driving. These colors also promote a feeling of being in control and are considered by many to be classic, elegant vehicle colors. I am on my second white vehicle, and I really love white cars. I confess that I tend to daydream while driving and having the focused energy of a METAL color around me keeps me paying attention, and calmer than those Fire colors do! Black and Dark Shades of most other colors represent the mystery and intrigue of the WATER element. It is no wonder that black is a popular choice for people who want to remain anonymous, secretive, or project an air of mystery. This is the popular choice for limousines, police cars and government transport vehicles. Add to that blacked out windows, and you have the ultimate fortress from prying eyes. High profile people, continuously surrounded by active FIRE energy, will appreciate the peace and calm they get riding in a blacked out car. There’s nothing like a large dose of WATER to cool off the intense heat of Fame! Black has become one of the most popular car colors. Perhaps it’s the desire to feel mysterious and cool that attracts so many to drive this color vehicle. No matter how new or old your vehicle is, respect and appreciate it by keeping its interior and exterior a positive reflection of you. Not only will you feel better, you will tend to have a better driving experience. And that is always Good Feng Shui! License plate brackets can be good Feng Shui! You can improve the energy flow of any space using Feng Shui principles, and that includes the vehicles you drive. Now that summertime travel is upon us, I thought it would be appropriate to address a space where we spend a lot of time – our motor vehicles. I have lived, and driven, in two of the most auto populated areas in the US: Los Angeles and Atlanta. I can honestly say that having good Feng Shui in and around my cars has kept me safe and (mostly) calm in both areas as I drive! Hopefully my suggestions will be helpful to you as well. 1. Keep it Clean! What applies to your home applies to your car. Empty water bottles or coffee cups, fast food bags, dried french fries, loose Cheerios on the floor, or papers strewn across the back seat does nothing to help you feel confident and in control of your driving (or your life). If you unexpectedly need to drive a friend, relative or co-worker somewhere, you won’t need to fumble around to clean a place off for them to sit, let alone have to apologize for the mess. I’ve been there, done that, and it is embarrassing! In addition, keeping a messy car sends a signal to the Universe that you do not appreciate and respect what you have. You may collect more dings and dents, have more technical problems or even tend to drive more disrespectfully around others. You won’t have the tendency to feel envious of others if you keep your vehicle clean inside and out. This does not mean you cannot admire newer, sexier vehicles – just remember who you are driving home at the end of the day! 2. Have a positive reminder in view. This can be a guardian angel charm, a small item given to you by someone special, a written affirmation posted on the dashboard, a window decal or photo. I always get a kick out of the dash vase the newer VW bugs have. OK, it’s a bit too cutesy for most, but I love the idea! It’s about having something uplifting in a space where you spend a lot of time. I have clear window clings with the words JOY and GRATITUDE on the bottom of each side of my windshield. It is my reminder to be thankful for having a great vehicle to take me where I want and need to go. Our son’s car has one that says PROTECTION. Our daughter has a Guardian Angel medallion on her dash. It doesn’t need to be big – just a visual reminder to start your drive on a positive note. 3. Send out a Blessing before you drive. Yes, I believe in angels and especially my driving angels! I ask them to watch over me, my car, and everyone else I am around every time I get behind the wheel. I visualize a protective white light surrounding me and whatever vehicle I am driving. If I’m running late, which occurs much less now, I ask that I arrive at my destination safely and on time. I then take a deep breath, relax and trust the traffic will cooperate. I can honestly say that I find I do arrive in time or there were delays on the other end which kept me from being the late one. I drive in the faster moving lane, get mostly green lights, and avoid erratic drivers the majority of the time. I don’t leave home without sending my blessing out! On long trips, I repeat my blessing every time I stop for food or fuel. I do the same for friends and family members that I know are driving home late or long distances. 4. Utilize the Fame/Reputation and Career areas of your vehicle. The front license plate bracket is in the Fame/Reputation and the back bracket is in the Career guas of the Bagua. These are great locations to advertise your business contact information or something else that represents you! 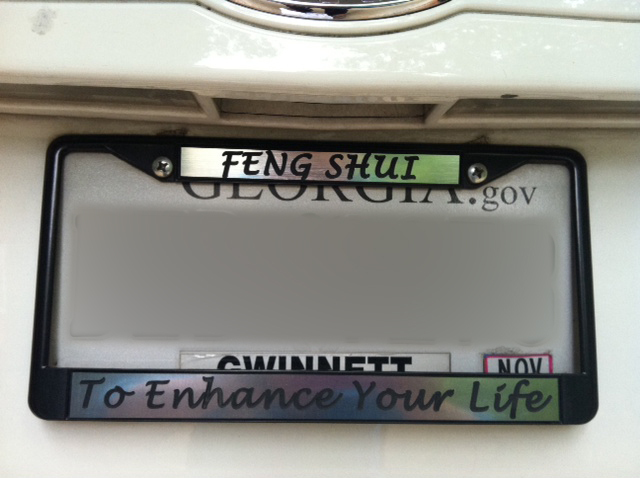 On the front of my minivan, I have the Yin/Yang symbol and my rear license bracket has a reference to Feng Shui. I have energized both of these brackets with the intention that they send out positive energy while I drive. The rear window and back of the vehicle work well too, so long as it doesn’t look cluttered or obstruct your view. Be conscious about displaying anything that may irritate or cause another driver to be distracted around you, such as highly reflective finishes or derogatory stickers. If that is your intent, however, be prepared to attract drivers around you that are irritated or distracted. My dad always told me that if I keep my car looking good and running well, I will keep it longer and enjoy it more, plus save money and headaches. How right he was! We currently own 4 vehicles and three of them have over 135k miles each. They all receive regular oil changes, and get the necessary repairs which have been minor given their use. Our mechanic shared with me that most people do not keep up with regular oil changes and check-ups, which cause most of the mechanical problems he sees. If something breaks, do what you can to repair it as soon as possible. As with your home, so with your vehicle – a grateful heart for what you have is always good Feng Shui! 6. Motorcycles need good Feng Shui too! My husband is back riding a motorcycle after a 25 year hiatus while raising our kids. As with most bikers, I know there is no problem with keeping them clean and in good repair – I wish my car was babied as much as his bike is! Because motorcycles can get easily lost in a blind spot, Wes also visualizes a protective white light around him every time he rides. His bike has the traditional Guardian Bell attached to the bottom of the bike chassis, to protect against road ‘gremlins’ (aka hazards). He also keeps a piece of Hematite, a wonderful grounding stone, in his front bike pouch to help him stay grounded and focused while riding. As with all Feng Shui enhancements, the intention behind them gives them energy and power. Medallions, crosses and the like can do the same thing. To some, all of this may sound Hokey or too ritualistic, which is OK by me. I know I am calmer and more relaxed when I drive and worry less about others. I keep sending my blessings out to all the drivers around me and hope they will feel as calm and relaxed as I am. Look for Part II of Feng Shui and Your Vehicle, where I will share my insights on car colors.